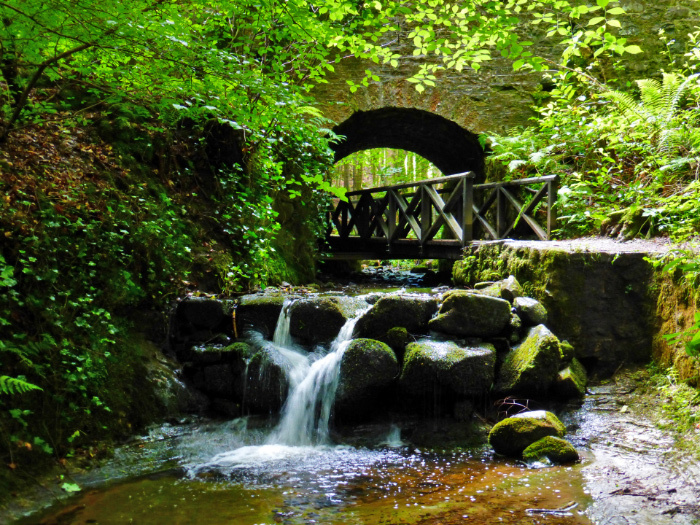 A steadily ascending walk up a narrow glen, taking in all kinds of curious historic bridges and structures on the Falkland Estate and culminating in a beautiful waterfall that you can walk behind. 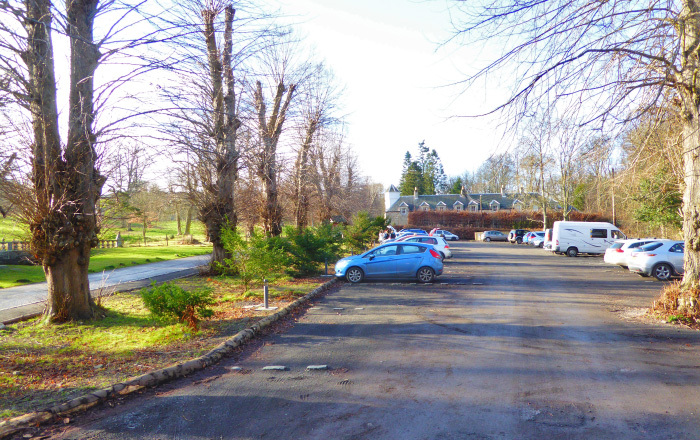 Start: The car park at the Falkland Centre for Stewardship. Suggested donation of £2. From the car park head up the estate road, keeping the stables building on your right. As you enter the woodland the road splits into three. Carry straight on up the middle road until, just before the road crosses a stone bridge over a burn, a large boulder on your left points the way to Maspie Den. Follow this path, which skirts around the 19th Century House of Falkland. Ignore the wooden steps to your left. At the next path junction turn left and then cross over the burn via the old stone bridge. You are now on the original ornamental path network that was laid out to accompany the house. Go through the short tunnel under the big stone bridge, keeping the burn to your left and continue through the forest. Don’t panic when you reach a tunnel through the hillside. It is quite short and by the time you have stepped inside, the light from the other end points the way. Kids will love it! 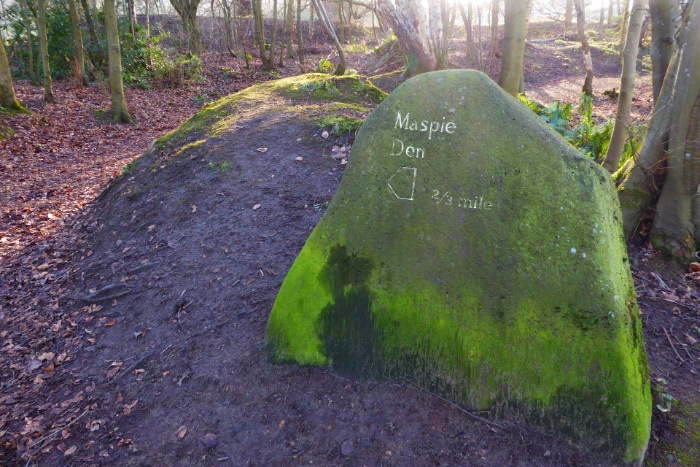 When you reach another big boulder that points the way to Maspie Den, turn left and cross the wooden bridge by the small waterfall. You now follow this path all the way to the top of Maspie Den, crossing the burn several times via a series of small bridges. 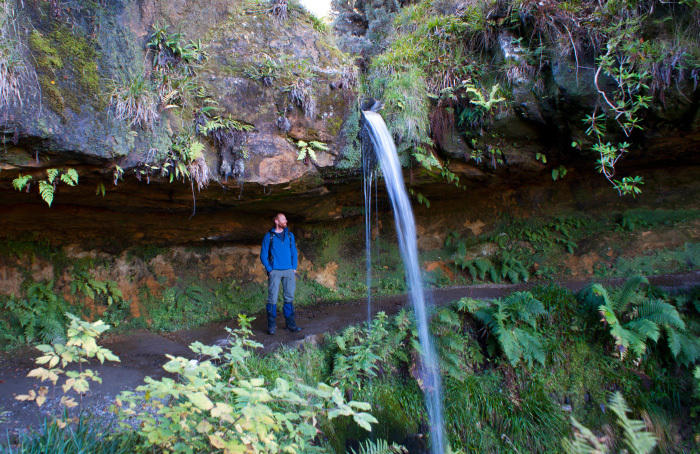 The first waterfall you encounter, accompanied by a handy bench, is Little Yad. The jumble of fallen trees here in the burn and along the den in general is largely the result of the huge storm that battered Central Scotland on 3rd January 2012. The Falkland Estate suffered particularly badly due to its location, with winds accelerating down the leeward slopes of the Lomonds. Winds in excess of 80mph brought down 10,000 trees on the estate, decimating the path network and destroying valuable habitat for the estate’s red squirrels. From here onwards the den gets narrower and wetter, and all too soon you round a bend to the left and can hear Yad waterfall just up ahead. It can be little more than a trickle after a dry spell but usually it is in full flow. The waterfall hasn’t completely frozen from top to bottom since December 2010, but after only a couple of subzero days on the trot you will get big icicles hanging from the roof. Be brave, walk into the undercut and stand behind the waterfall. It’s a lovely (if damp) spot to spend a little time. Follow the path behind the waterfall and climb out of the den on the other side. This short stretch is usually the muddiest part of the whole walk so watch your step. When you reach a path, turn right and head back downhill towards Falkland. 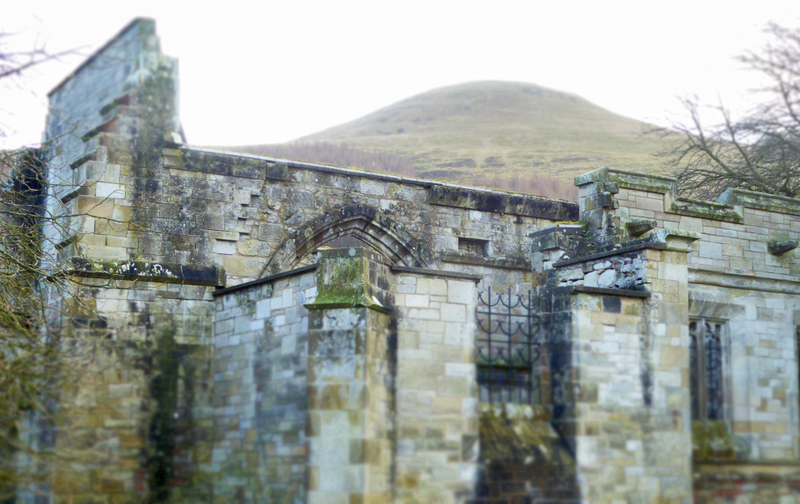 To your right, the towering cone of East Lomond (Falkland Hill) looms large. As you approach the old byre buildings ignore the path that veers off to the left, instead continue downhill, keeping the byre on your left. Cross over the burn to join a large forest road and then turn right. Up ahead the road bends to the right across a stone bridge but you want to take the path that goes off to the left just before the bridge. This path brings you out at the wooden bridge you crossed earlier. Cross the small stone bridge where a boulder says ‘Stables via South car park’. Climb some small steps and then at a crossroads of dirt paths, continue straight on. You’ll pass a big red tree trunk on your right. This is a redwood, a tree native to the western United States and it has the most wonderfully soft bark. Go on, touch it! Carry along the path as it snakes its way through the woods, climbing uphill before joining another burn. Follow the burn all the way to an old black metal fence. Go through the gate into the open field, and note there may be animals here so keep your dog on a short lead or under close control. Follow the clear path along the route of the burn. Behind you and to your left you now have an unobstructed view of the House of Falkland, originally the pile of the Tyndall Bruces but now a boys’ school. When the burn veers left, cross the small bridge and go through a gate, and then follow the path to the Crichton Stuart mausoleum. It looks older but was actually built in the 1910s. The path continues through another gate in the black metal fence before leading past the duck pond and back to the car park. Refreshments and Info: The very welcoming Information Hub in the Stables building has maps, hot drinks and very light snacks, and is open 10 till 4 every day.